Interested in starting a recycling program at your school? Want to learn more about the fundraising possibilities from the HI5 beverage container deposit program? Curious to know what other schools have already done about recycling? Learn about recycling through an adventure with Kai as he learns the importance of practicing the 3 R’s and discovers ways he can Reduce, Reuse, and Recycle. The HI-5 Recycling Program, Kokua Hawaii Foundation, and Kahilu Theatre partnered together to bring “The Trash Heap” musical production to Hawaii schools. Kokua Hawaii Foundation provided a free educational guide to accompany the production and further learning. 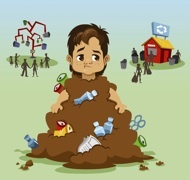 Teachers can obtain a copy of the guide here: “The Trash Heap” Musical Production. The Department of Health and University of Hawaii Sea Grant Program collaborated on an effort to assist schools interested in developing a recycling program. The resources below are available for your school. For more information, contact us at (808) 586-4226.